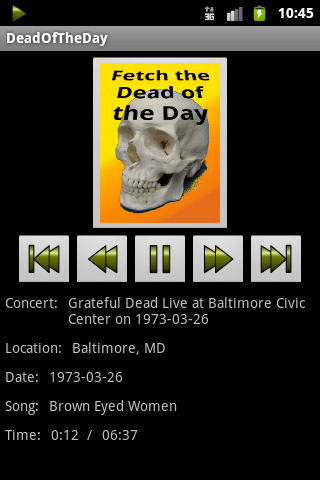 Fetch the Dead Of The Day, from thousands of concerts made available online by the Grateful Dead and their fans. The DeadOfTheDay app provides a simple and elegant interface to listen to music from the Internet Archive, which houses the most extensive collection of live recordings ever assembled. At the push of a button, the DeadOfTheDay app selects and streams a song from a concert played on the current date, week, or month from the band’s 30 years of touring. The simple media player interface displays concert venue, date, and song title, and lets you navigate through the concert – pause and restart playback, skip or repeat songs, go to the start or end of the concert. You can set concert search preferences according to your taste – choose crystal-clear soundboard feeds or rowdy, smoky audience recordings; select from your favorite years and decades; pick a random song or listen to an entire concert; and save your favorites for repeated enjoyment. Whether you’re a die-hard Deadhead or just discovering the Dead, you’re sure to enjoy thousands of hours of the best live music ever recorded. Have you had your Dead Of The Day? The recordings in the Internet Archive are of high quality and thus use a lot of bandwidth; the average bitrate is around 150 to 200 kilobits per second, or about 1 to 1.5 Megabytes per minute. Thus a complete concert can be between 200 and 300 Megabytes; if you have a limited data plan, you’ll want to monitor your data usage. I don’t collect, use or share any information about users of this app or their activities.